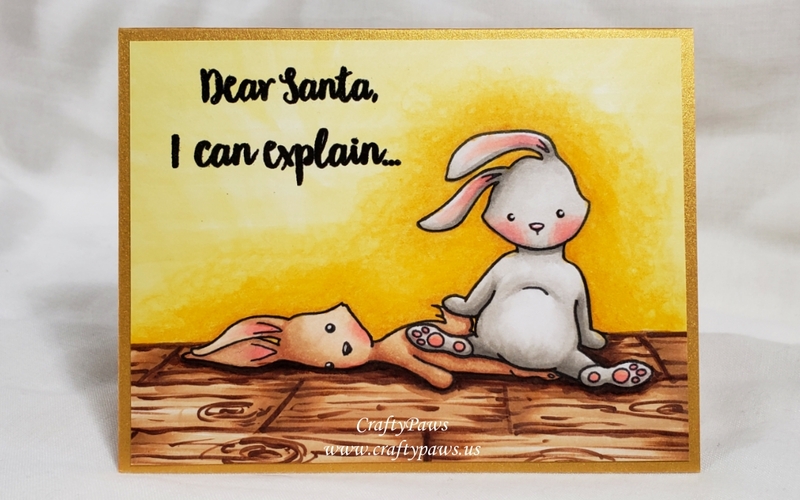 I love the expressive Blah Bunny series from Honey Bee Stamps. They are so whimsical and they are perfect for funny cards; I know this card for my brother will make him smile. For today’s card, I am drawing from my childhood memories of wresting with my older brother (he’s 5 1/2 years older than me so you can imagine the abuse I withstood and how much I WISHED he would let up) and him acting all innocent whenever he was caught. I decided to combine the flattened bunny from the original “Blah Bunny” stamp set and positioned the sprawled out seated bunny with arms back from the “Blah Humbunny” stamp set to create a scene of two bunnies caught in a moment of full-on sibling wrestling. I first stamped out the seated bunny slightly askew, masked him with a post-it note cut out, and then stamped the flattened bunny underneath him. I really like how it looks like the seated bunny has pinned his sister, and how she looks like she may be squeezing her way out from under him. 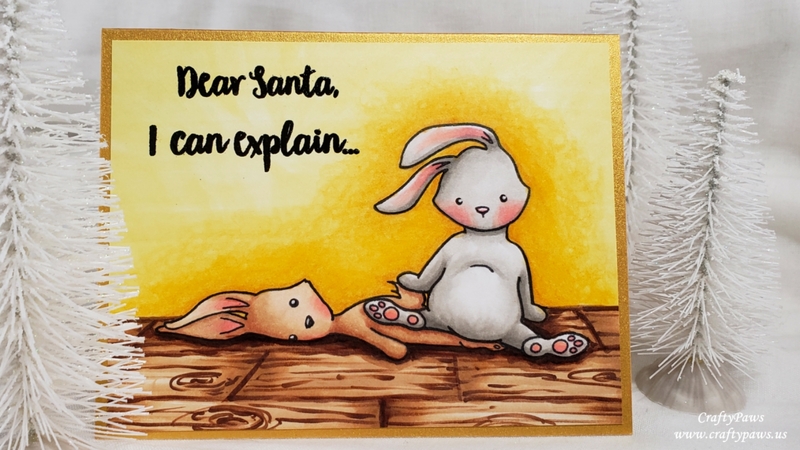 For the sentiment that brings the whole scene together, I stamped out “Dear Santa, I can explain…” from the “Blah Humbunny” stamp set with Versafine Black Onyx Ink. Then I sprinkled Ranger Black Embossing Powder over top and used my heat tool to set and make is embossed and shiny. I wanted to golden halos around the bunnies to be re-emphasized so I cut down the card front a bit and adhered it to a shiny gold card base, with just an 1/8th of the card base showing all around.